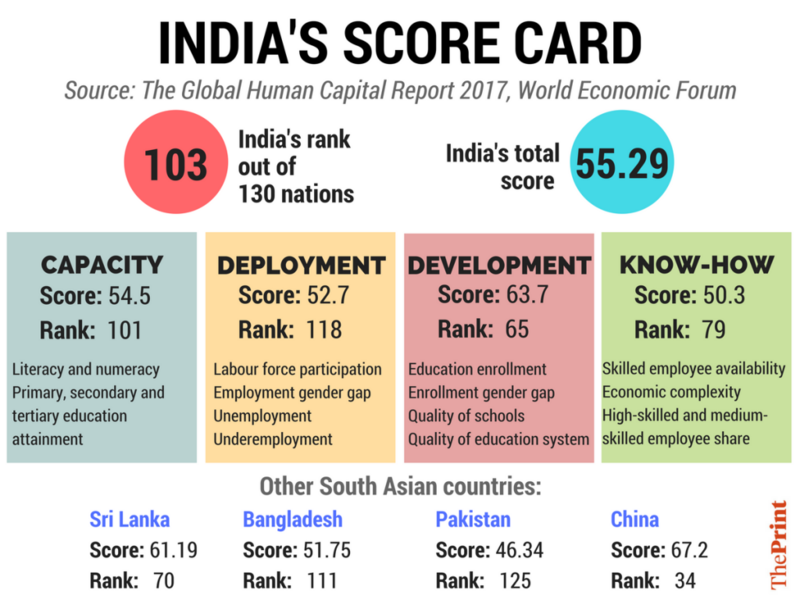 The Global Human Capital Index sees India finish 103rd among 130 countries, behind Sri Lanka and Nepal, and just ahead of Bangladesh and Pakistan. In a scathing commentary on how India is handling its demographic dividend, the World Economic Forum’s Global Human Capital Index 2017 has ranked India 103rd among a list of 130 countries. India stands at the bottom of the heap among the G20 nations, is the lowest among BRICS nations, and stands painted in a corner even in South Asia. 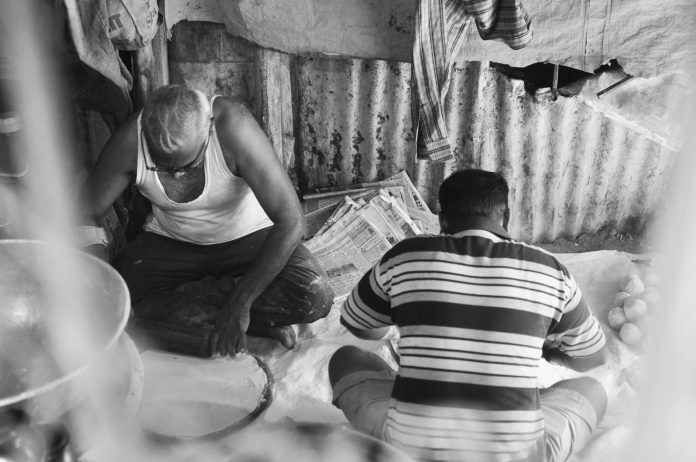 Dragged down by its poor labour participation and one the most gaping employment gender gaps, India is found to be struggling against huge challenges, even though there are signs that it is now moving in the right direction. The Global Human Capital Index 2017 ranks 130 countries on how well they are developing their human capital on a scale from 0 (worst) to 100 (best). The rankings are based on four thematic dimensions — capacity, deployment, development, and know-how — and five distinct age groups or generations — 0-14 years; 15-24 years; 25-54 years; 55-64 years; and 65 years and over — to capture the full human capital potential profile of a country. The index is led by Scandinavian nations Norway, Finland and Switzerland, followed by large economies such as the US and Germany. In South Asia, the race is led by Sri Lanka at rank 70 and Nepal at 98, while India has only a quantum of solace – that it performs slightly better than Bangladesh (111) and Pakistan (125). With the exception of Sri Lanka, the other South Asian countries are yet to reach the 60 per cent threshold with regard to developing their human capital. India ranks 110th in primary education attainment among 25-54 age group, 118th in labour force participation in the same age group, 111th in vocation education enrolment rate, 120th in medium-skilled employment. However, the most dubious distinction for the country is that it ranks dead last across all age groups in the employment gender gap. The report observes that although India’s “current educational attainment rate has improved markedly over past generations, its youth literacy rate is still only 89 per cent, well behind the rates of other leading emerging markets, as well as the lower-middle income group’s average. India also ranks poorly in labour force participation, due in part to one of the world’s largest employment gender gaps”. With the gender gap a clear factor pulling India down, the remedy lies in bridging it. The report notes that “a primary avenue for realising a greater share of the nation’s human capital potential consists in creating a virtuous cycle by increasing inclusivity and expanding access to its numerous learning and employment opportunities”. There are, however, signs that India is slowly moving in the right direction, despite the huge challenges it faces. The country scores well on the ‘know-how’ parameter that measures the use of specialised skills at work – India ranks 42nd in terms of economic complexity, 47th in availability of skilled employees, and 89th in high-skilled employment share. The other markers are that India ranks well on are its improving education system (27th), skill diversity of graduates (58th) and high-skilled employment share (89th). On an average, the world has developed only 62 per cent of its human capital. Across the index, there are only 25 nations that have tapped 70 per cent of their human capital or more, while 14 countries remain below 50 per cent. The overall average score for South Asia is 54.10 — behind the Middle East and North Africa and ahead of Sub-Saharan Africa. China performs strongly, finishing 34th in the rankings. The report says it does best on the deployment sub-index, and also performs relatively well across the development and know-how sub-indices. China is well ahead of the other BRICS nations except Russia, which the former’s rapid expansion of educational attainment across its younger generations poised to be an asset in preparing its future workforce.